Nagula Chaviti is yet another important festival celebrated by Telugu people of Andhra Pradesh. As the name implies 'Nagula' means 'of the serpents' in Telugu language and 'Chaviti' means 'fourth', the 'festival of serpents' is celebrated on the 4th day after Deepavali Amavasya (No Moon day) in the auspicious Hindu month of Kartika Masam. Nagula Chaviti is one of the important festivals in Andhra Pradesh which is celebrated with much devotion. It is a day fully dedicated to 'Serpents / Snakes' as these are considered as one of the foremost Gods in Hinduism. The festival reflects the harmonious communion between the venomous creatures and humans. In the olden days when there was no advancement of science and there was no scientific approach, a majority of the people in the rural India were becoming victims of poisonous snake bites. 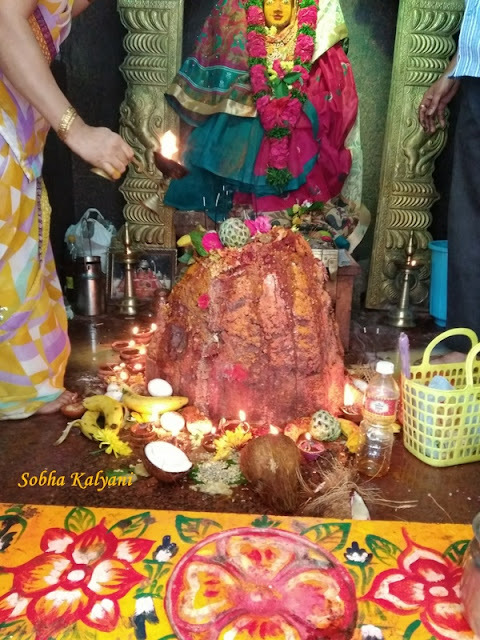 In addition to it, even there is a belief in Hinduism that serpents / snakes have an influence on the womb of women and so even for progeny most of the Telugu ladies worship snake god. Accordingly, Nagula Chaviti has its own importance in the region and almost all the Telugu people irrespective of caste, creed, gender and age celebrate the festival with much devotion. As per Hindu mythology, it is believed Divine Serpent Adi Seshu was used for the tremendous task of churning the Milky Ocean or Sagara Madhanam by the Devatas (gods) and Asuras (demons). While churning, the divine serpent got irritated and lo! it expelled terribly destructive poison called Halahalam which started enveloping the Universe. To save the Universe and its creature from the poison that was spreading fast, Devas and Asuras immediately approached Lord Shiva and requested him to stop the further pollution of the Universe. It is believed that on Nagula Chaviti day Lord Shiva consumed the destructive poison to save the universe and its creature. Goddess Parvati who was shocked by this act of her husband, managed to retain the poison in Shiva's neck region only without spreading to his body. Thus Lord Shiva's neck turned bluish in color and from thence he got the name Neelakanta ('neela' means blue and 'kanta' means neck). The women are much involved in the festival celebrations and they observe fasting during the day for the longevity and welfare of their family members particularly for their children. Like any other Hindu festival, make necessary arrangements for the pooja the previous day itself. On the festival day, most of the people particularly women folk observe fasting during the day. A majority of the people go to the nearby snake burrows (ant hills), clean up a little portion in front of the ant hill and decorate the ground with muggulu / rangoli. They light up oil lamps, agarbati / incense sticks and offer to the snake god. 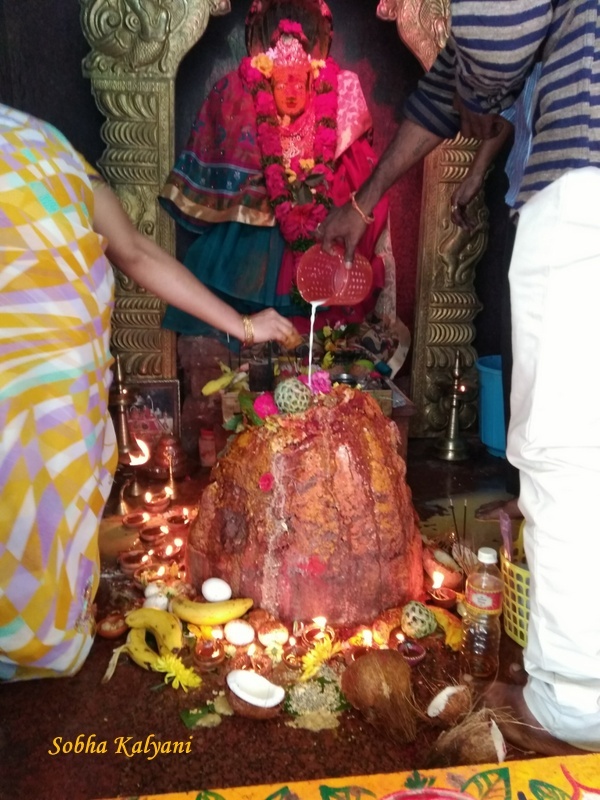 They then smear or literally pour turmeric power and vermilion (kumkuma) on the ant hills, pour tumblers full of milk into the ant hill and mostly non-vegetarians either drop eggs into the ant hills or place it on the openings of the ant hill. While vegetarians offer naivedyam like 'chalimidi' (made of rice flour and jaggery or sugar), 'chimmili' (made by crushing a mixture of white sesame seeds and jaggery) and 'vadapappu' (soaking split green gram / yellow moong dal / pesarapappu and adding sugar to it). At the end of the pooja, people burn firecrackers in front of the snake burrows / ant hills. In the evening, after performing pooja and lighting up oil lamps, break their fasting and then celebrate the evening as a mini Deepavali by burning the leftover firecrackers. However, keeping in view the ever increasing ecological imbalance, such a practice of pouring milk into the snakes habitats, dropping of eggs into the burrows or closing the openings of snake burrows by placing eggs and burning firecrackers in front of the snake's habitats need to be discouraged. As such practices or blind beliefs further reduce the snake population. In some regions, snake charmers literally get the snakes in their baskets and people offer their prayers directly to the snakes. The snake charmers thus make money on the festival day. Even such a practice of celebration should be discouraged as this might directly harm the snakes. Though the very significance of the festival is to have a harmonious communion between the snakes / serpents and humans yet the illiterates are unaware of certain facts and are unknowingly causing harm to the species. In most of the Shiva temples in the South, there are 'Naga Pratima' or idols of snakes placed generally under Peepal / Banyan trees. Many people go to such temples and offer their prayers to the 'Naga Pratima'. While others, as per their family customs perform the pooja in their homes. Date of Nagula Chaviti - November 11, 2018 (Sunday).